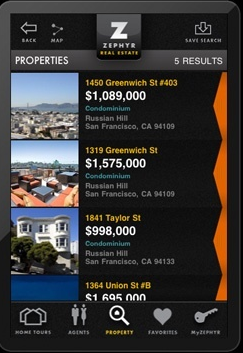 I’m excited to announce that the Zephyr Real Estate Search iPhone app is now available in the iTunes store. Our MLS-powered app lets you search all available properties in San Francisco. It’s the ONLY app that allows you to search by specific neighborhood, rather than just by zip code. With our GPS-powered app, you can also search for homes near you, or set your own search criteria, and get full details on all the properties. Create a free account for even more features like saving favorites, getting new listing and price reduction email alerts, searching sold properties, finding additional properties not shown on public websites, creating a custom multi-property driving tour with our exclusive Home Tour tool and more.